It’s Time to Take Control of Your Closet! You can’t fit another hanger onto the rack without forcing it in? The closet rod is bending, or worse yet, it’s pulling away from the wall? You have a closet full of clothes but nothing to wear? Congratulations! A well-edited and organized closet not only alleviates stress, but it can also minimize future expense. It’s a critical step to streamlining your routine and having a wardrobe that works for you not against you. Most women wear only 20% of their clothes 80% of the time. 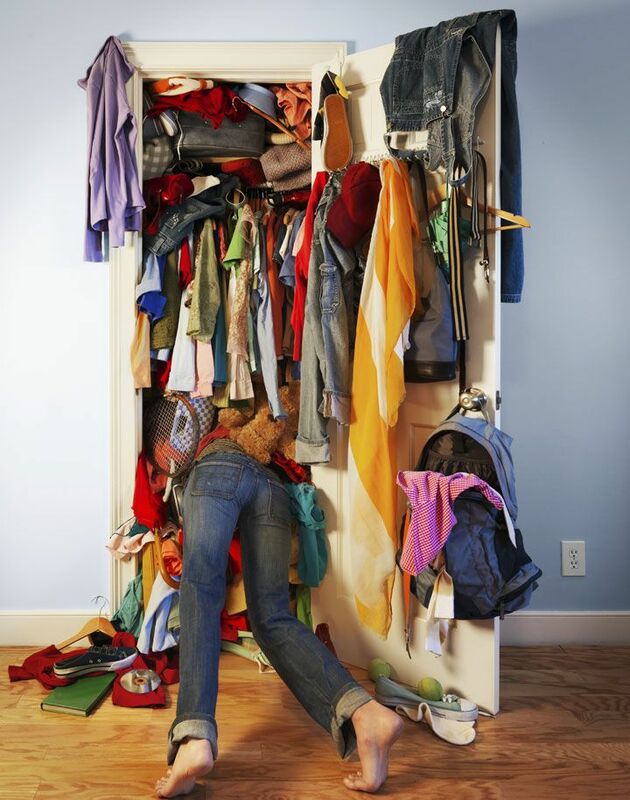 Closet clutter causes confusion and a closet overflowing with clothes you don’t wear slows you down. Cleaning out and organizing your closet doesn’t have to be painful. Why not set aside some time now, at the beginning of the year, to gain control of your closet? Schedule two-hour blocks of time over a week, or one long morning or afternoon. Set the mood with music and pour a cup of coffee…or a glass of wine, depending upon the time of day! Style your hair and put on your makeup and good underwear. Yes, you’ll be trying on most of your clothes and nothing will look good if you don’t. 1. Full-length mirror – if not already installed, it’s an investment you must make, even if it’s the simple over-the-door variety. 2. Sticky notes to label items needing repair or alteration. 3. Large trash bags labeled: “Consign”, “Donate”, “Toss”. 4. Quality hangers to replace any wire ones you’re currently using (see tips below). 1. Pull everything out of your closet and drawers. (If you live in an area with a change of seasons, focus on clothing for the current season and repeat this process at the beginning of the next season.) Your goal is to divide and conquer: What to “Keep” vs. what to “Cast Off”. 2. Group like items together. If you have six pairs of black pants you’ll want to evaluate them against one another. I like to start with bottoms, then tops, dresses and shoes. 3. Don’t forget your underwear, socks and hosiery, and accessories (scarves, jewelry and bags). 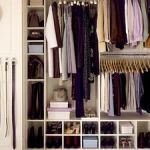 These may not all be in your closet but they deserve the same edit-and-organize process if you want to streamline your dressing routine. 4. Try on everything. You can’t tell how something looks by just holding it up to yourself. You have to see the item on you. Let’s face it, our bodies can change one year to the next. And washing and dry cleaning can shrink clothing over time. Be sure to try on the right shoes and undergarments with each item. TO KEEP OR CAST OFF? 1. It is ripped, stained, or simply worn out. 2. It doesn’t fit. What’s the likelihood of it fitting in the future? Can it be altered to fit? Note: If you plan to lose weight, you will want to go shopping to reward yourself! Note: Fashions can come and go and come back again; but it seems that they never come back exactly the same. Depending upon cost, restyling a garment might be a possibility. But, how much will it cost and would you pay that much to buy the item new? Would replacing the item be less expensive? 4. The color does not flatter your skin tone (see my earlier posts on Color). Note: Have you had your colors done? If so, you can speed up this process by first sorting out the colors that are not in your palette. That’s why you had your colors done! 5. You aren’t wearing it (you loved the color, or it was a great bargain, but it really wasn’t “You”) and/or you haven’t worn it in two years, because chances are you won’t. Finally, if closet space is tight and you have multiple very similar items, such as those six pairs of black pants, consider whether you need them all. Pare down to those that fit best, are the most current, and in top condition. If any “Keepers” need cleaning or minor repairs, label them with a sticky note and take care of it ASAP. Friends or relatives – it may no longer be “you” but someone else might love it. Consignment shops generally pay 50% of the resale price. Clothes need to be cleaned, pressed, repaired, and seasonally correct. Dress for Success: The clothing they provide women is primarily for job interviews. Most chapters can only accept items in clean and good condition, current style and all-season weight, and on hangers. Goodwill or other charitable organizations are the best place for gently worn, out-of-season clothing, and your contribution will be tax deductible. What about worn-out or torn items? Before trashing them, please check online for a recycler in your area who accepts and reuses textiles. Your goal is to be able to see everything every time you open the closet door so it’s much easier and faster to get dressed in the morning. 1. Hang everything you ca n. Don’t put anything in drawers that you can hang or stack on open shelves (out of sight, out of mind!). 2. Double your hanging space by creating two hanging levels so that you can hang each garment separately and see tops in relation to bottoms. You’ll be amazed at how many new combinations suddenly appear. Separate the suit pants and skirts from their jackets so the pieces can be worn separately. Note: You don’t have to remodel! The Container Store offers an affordable double hang closet rod solution. 3. Keep like items together by categorizing your clothing by function – for me it’s active wear/daywear/evening wear – then by type: jackets, skirts, pants, dresses, etc. 4. Organize by color – light to dark, starting with neutrals followed by colors of the rainbow: red, orange, yellow, green, blue and purple. This creates an aesthetic that is pleasing to the eye when you open the door to your closet! 5. Pants – If using double hanging space, hang them uniformly folded over non-slip pant hangers. If you need to hang them in a long-hanging space, use clip-style hangers and hang them from the waist. 6. Skirts – You can maximize closet space by using cascading clip hangers. 7. Jackets, shirts and blouses – Use hangers that support the shoulder and the weight of the garment. For blouses and shirts I use color-matching plastic tubular hangers. For jackets I prefer a hanger with more shoulder shape to provide shoulder support. Note: Many wardrobe consultants favor the space-saving hangers with the velvety non-slip finish for all needs. This will give you a nice coordinated look! 8. Sweaters are best folded, either stacked on a shelf or individually folded over a hanger. Vertical shelf dividers that clip onto the shelf will keep the stacks tidy. See-through plastic boxes are perfect for dust-free shelf storage for sweaters and ideal for shoes. Label them for speedier access. 9. Store accessories so they are visible and accessible. Use the inside of the doors for extra hanging space. Add towel bars for folded sweaters or scarves, a shoe rack, and/or cup hooks for jewelry or belts. 1. Turn the hangers around. 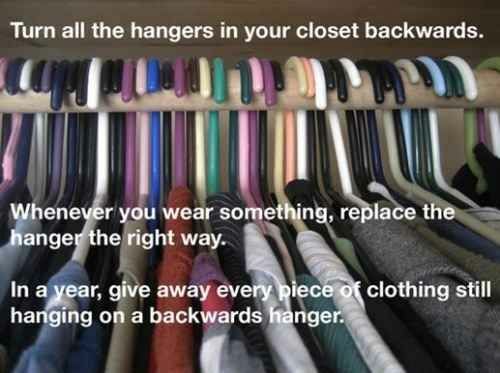 Turn all of the hangers holding clothes in your closet backwards. When you wear something, return it to its place with the hanger turned correctly. At the end of the season, you‘ll have an accurate record of what you wore and what you didn’t. 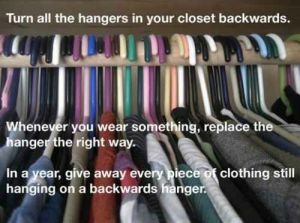 Consider this: In a year, give away every piece of clothing still hanging on a backwards hanger! 3. Don’t overcrowd. Stow seasonal items in a separate closet or storage space. 4. Remove all plastic dry cleaning bags from every item in your closet. They trap dry cleaning chemicals and can cause staining. 5. Banish wire hangers! Remove dry-cleaned items from wire hangers as soon as you get them home and hang them on proper hangers. Congratulations! You’ve streamlined your wardrobe and dressing everyday should be quicker and stress-free. Note: All photos from Pinterest unless otherwise noted. If the thought of doing a closet edit alone is overwhelming, or you find it difficult to perform an honest assessment of your wardrobe, then it’s time to get some help. 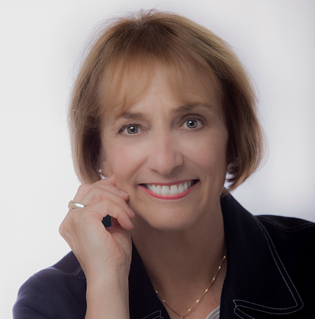 Contact me – I’m here to guide and advise you! I have been knee deep in my closets finally paring down a bit. We should do this in pairs with a funny friend. Just happened to see your blog, and thought the timing is sure right. I have to say, I do feel freer since cleaning. Nice hearing from you on a timeless subject and thank you for your advice. Hi Mary … I’m delighted this post reached you at the right time! If you need any tough love in making a toss decision don’t hesitate to contact me. We can Skype or FaceTime :-). Use closet organizing apps! Until I started putting photos of my clothes and accessories into the organizer, I forget that I own many of my pieces and so I go and buy more pieces! I had no idea I already own so many workable items already! Great idea, Denise — thanks for sharing!